anticipated and much enjoyed every spring. There are a few trees that bloom in the summer and fall, but spring is the high season for the prima donnas of the tree world to put on their show. As much as I enjoy seeing them in botanical gardens and while driving around town, I want them in my own garden, too! 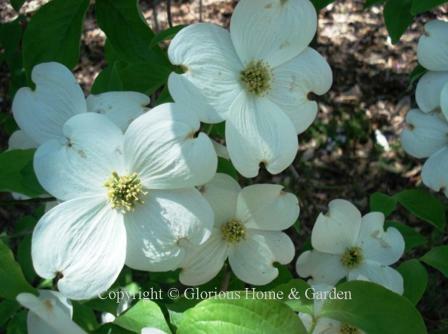 Magnolias and cherries, dogwoods and redbuds, pears and crabapples--there are so many gorgeous ones to choose from, it's tempting to want a few of each! It's hard to choose a favorite, but mine may just be the Yoshino cherry. I only have a couple, and browsing deer did a number on one of them, but they are so beautiful I've got to add more. I love the soft white to pale pink cloud of bloom before the leaves emerge, as delicate as bubbles, and then the carpet of pink snow as the petals fall. As a bonus, the leaves turn a good color in the fall. What's your favorite? Everyone needs at least one beautiful flowering tree! Even in the smallest yard, one gorgeous tree can make the landscape. One of the first things anyone should do when purchasing a new home, especially if the garden is a blank slate, is to plant a few spring flowering trees. Shade trees as well, of course, given how long they take to mature, but a couple of your favorite blooming trees will give you instant delight and create the basis for your garden. If you are fortunate enough to have a property with mature shade trees, then all you may have to do is add a few of your favorite flowering trees to enhance your property. Here is a list of some favorite spring flowering trees to choose from. Aesculus hippocastanum, European horsechestnut, Zones 4-7. This flowering tree has large dense trusses of white flowers with pink centers and is very eye-catching when in bloom in late April to mid-May. But be aware that this is a big tree that can reach 75' or more, so is best suited to large gardens. 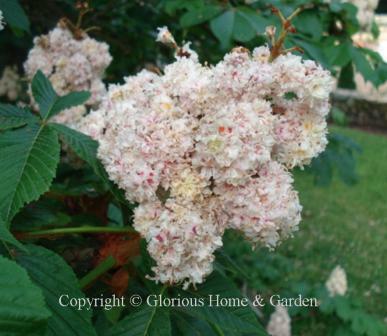 open than the European horsechestnut, and growing to about 35' makes it a better candidate for smaller gardens. 'Ft. 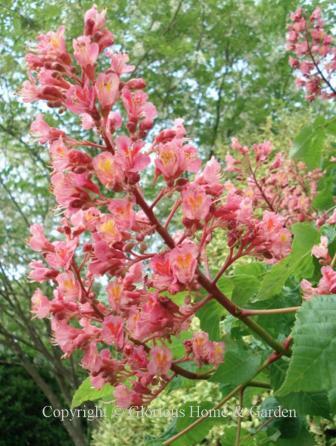 McNair' has upward facing pink flowers with yellow throats at the tips of branches that give the tree a sort of candelabra effect. native is very striking in bloom with its large panicles of ruffled white tubular flowers that are streaked with purple and spotted with yellow. Cercis canadensis, redbud, Zones 4-9. Taking the stage just before flowering dogwoods and then in concert with them for a time, redbuds and dogwoods blooming together make beautiful music in the spring woodland--and in our gardens! The combination of redbuds in bloom with the emerging green leaves of other trees is just stunning. 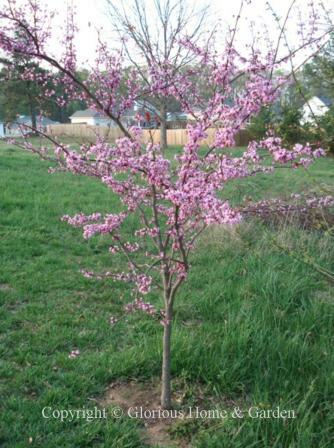 Though called redbuds, the buds and flowers are more purpleish-pink than red, and resemble little sweet pea blooms. They have the curious habit of popping out along the length of a branch, and even directly from the trunk, before the leaves appear and are followed by long pea-pod like seedpods. 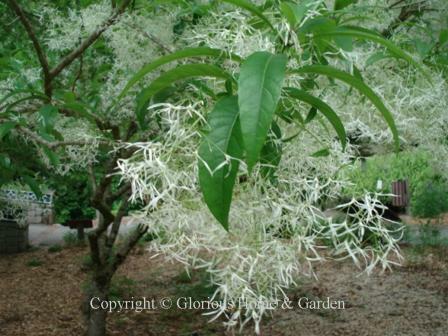 Chionanthus retusus, Chinese fringetree, Zones 6-8. Clouds of pure white blooms smother this flowering tree, looking like a late spring snow has settled on the branches. The wide dome shape, coupled with handsome bark and olive-like fruits make this tree a choice selection for an ornamental specimen. 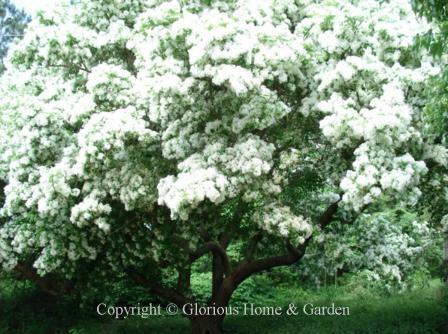 Chionanthus virginicus, white fringetree, Zones 4-9. Our American native fringetree is also very handsome in bloom. 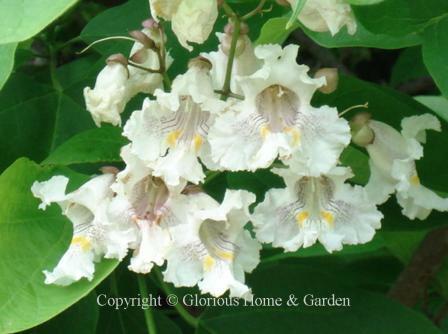 It has a lighter, airier look due to the long, narrow white petals. 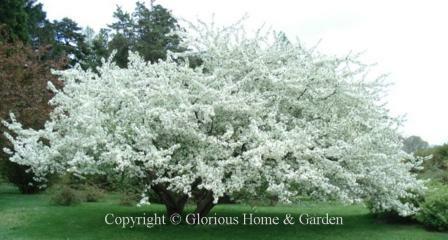 Easy to grow and adaptable, this small tree or large shrub deserves wider planting in our gardens. Cladrastis kentukea, American yellowwood, Zones 4-8. A very lovely flowering tree in full bloom. The fragrant white flowers appear in pendulous clusters at the ends of the branches. 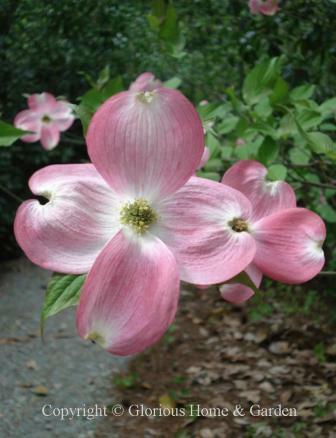 Flowering dogwoods are unfortunately susceptible to several pests and diseases among them dogwood borer and anthracnose. For this reason, it is not a good ideas to dig up young seedlings in the woods. 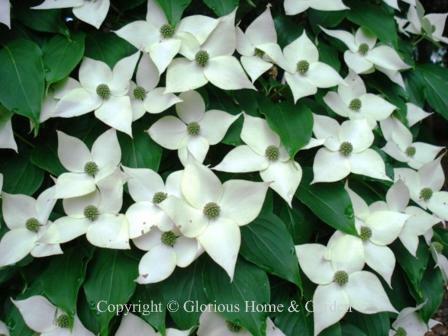 Planting them in your garden may expose your existing dogwoods (and your neighbor's) to these blights. Named cultivars have been chosen for their disease resistance, and they flower more abundantly to boot. Rutgers University has developed new hybrids that are a cross between C. florida and C. kousa that have greater disease resistance and share some of the best features of both species, though they do not produce fruit. 'Aurora,' 'Celestial,' 'Constellation' and 'Venus' (3rd picture below) are white; and 'Stellar Pink,' is, well, pink. 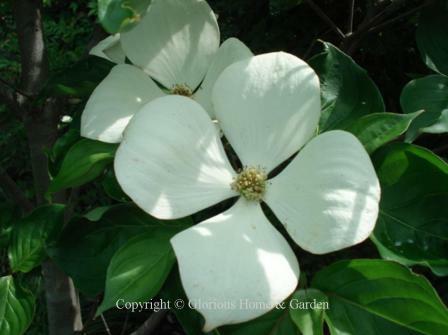 Cornus kousa, Kousa or Chinese dogwood, Zones 5-8. Kousas are great to extend the dogwood blooming season as they open in May or June after C. florida is finished, and after the leaves have appeared. But the effect can be just as spectacular! The showy bracts are smaller than on C. florida and are pointed. Added benefits are the round, red raspberry-like fruits that ripen in fall and the exfoliating bark. C. kousa is also less susceptible to the diseases that plague C. florida. A couple of good cultivars are 'Milky Way,' known for its prolific flower and fruit production; and 'Wolf Eyes,' a variegated form. 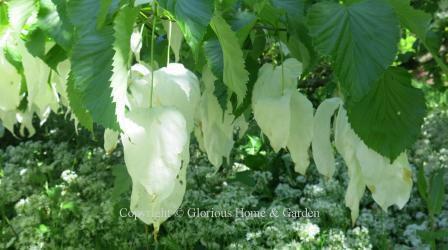 Davidia involucrata, dove or handkerchief tree, Zones 6-7. The long white bracts enclosing the flowering center give the appearance of fluttering wings hence the common name. Very unusual. Halesia diptera, two-winged silverbell, Zones 5-8. The two-winged silverbell is another American species native to Southeast. 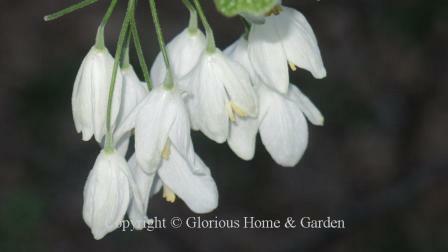 Smaller than the Carolina silverbell, it makes a multi-stemmed large shrub or small flowering tree to about 20 to 30'. The white flowers open a bit later than H. tetraptera. Halesia tetraptera, Carolina silverbell, Zones 4-8. 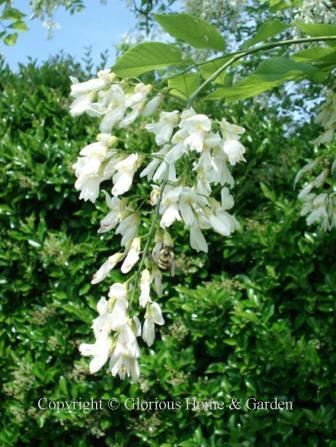 A lovely flowering tree for the understory or woodland garden, Carolina silverbell has pure white or pale pink, bell-shaped pendulous flowers in mid-spring. A native American species. 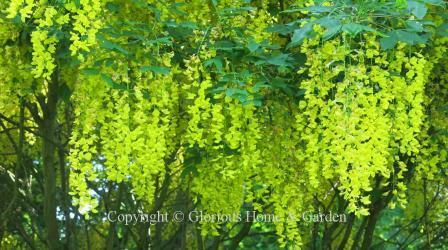 Laburnum X watereri, Waterer laburnum or goldenchain tree, Zones 5-7. Grown for its large, pendulous trusses of yellow pea-like flowers, Waterer laburnum is a spectacular sight in full bloom. It has been used to great effect in Europe over trellises and arches. Best for the cooler climes of the northeast. Beware of using this where children are about as the seeds are poisonous. 'Vossii' has a superior habit and longer flower racemes. 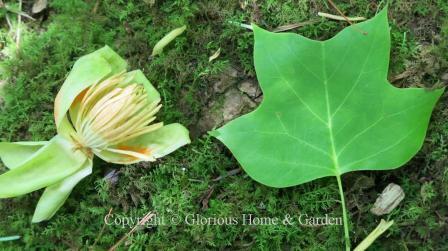 Liriodendron tulipifera, tuliptree, Zones 4-9. The flowers of the tuliptree do indeed resemble a tulip (as do the outline of the leaves), but they are usually carried in the upper branches of these tall trees they often go unnoticed unless knocked to the ground in a windstorm.